TSS consisted of a satellite, tether, and a tether deployment/retrieval system which remained on the Space Shuttle. 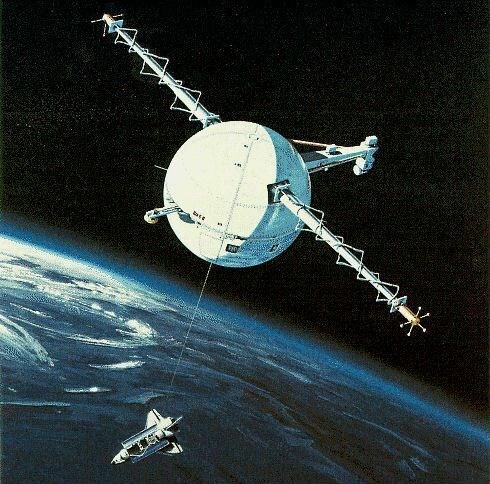 The space tether experiment was a joint project between NASA and the Italian Space Agency, designed to study the electrodynamics of a tether system in the ionosphere, the region of the upper atmosphere populated by charged particles – electrons and ions. TSS-1 was also meant to test and develop the capability for future tether applications on the Shuttle and Space Station. The TSS satellite – a gumball-like spacecraft with a 1.6-meter diameter – was deployed from the US Space Shuttle and remained connected by a conducting tether. The shuttle dragged the tether across the Earth’s magnetic field, thus producing one part of a dynamo circuit. The experiment intended to determine whether this system could produce electric power, generating current to run equipment aboard the space shuttle. Because of a technical problem (a protruding bolt in the deploying mechanism), TSS-1 could not fully deploy to its 12.5-mile extent; instead it was only released to 840 feet. examine the electromagnetic interaction between the TSS and the ambient space plasma. Five hours after deployment began on February 25, 1996, with 12.24 miles (of 12.5 miles planned) tether released, the tether cable suddenly snapped near the top of the deployment boom. The malfunction was later attributed to an electrical discharge through fractured insulation. Unrestrained, the TSS satellite shot away into higher orbit. TSS instruments were reactivated and produced data for three days until batter power ran out. Despite the malfunctions, the TSS missions were able to supply useful data. Currents measured during deployment were at least three times greater than predicted by analytical models, and the amount of power generated was directly proportional to the current. Scientists were also able to examine ionized shock wave and plasma waves around the satellite, and how gas from the satellites’ thrusters interacts with the ionosphere.